“Dietrich Fischer-Dieskau was by virtual acclamation one of the world’s great singers, from the 1940's to his official retirement in 1992, and an influential teacher and orchestra conductor for many years thereafter. He was also a formidable industry, making hundreds of recordings that pretty much set the modern standard for performances of lieder, the musical settings of poems first popular in the 18th and 19th centuries. But he was essentially a lyrical, introspective singer whose effect on listeners was not to nail them to their seat backs, but rather to draw them into the very heart of song. The pianist Gerald Moore, who accompanied many great artists of the postwar decades, said Mr. Fischer-Dieskau had a flawless sense of rhythm and ‘one of the most remarkable voices in history — honeyed and suavely expressive’. Onstage he projected a masculine sensitivity informed by a cultivated upbringing and by dispiriting losses in World War II: the destruction of his family home, the death of his feeble brother in a Nazi institution, induction into the Wehrmacht when he had scarcely begun his voice studies at the Berlin Conservatory. He had the good luck to age well, too. In 1988, at 62, he sang an all-Schumann program at Carnegie Hall, where people overflowed onto the stage to hear him. Donal Henahan, then the chief music critic of The New York Times, noted that Mr. Fischer-Dieskau’s voice had begun to harden in some difficult passages — but also that he was tall and lean and handsomer than ever, and had lost none of his commanding presence. Mr. Fischer-Dieskau described in his memoir REVERBERATIONS (1989) how his affinity for lieder had been formed in childhood. ‘I was won over to poetry at an early age’, he wrote. ‘I have been in its thrall all my life because I was made to read it, because it gave me pleasure, and because I eventually came to understand what I was reading’. He discerned, he said, that ‘music and poetry have a common domain, from which they draw inspiration and in which they operate: the landscape of the soul’. Before adolescence Dietrich was inducted into a Hitler Youth group where, he recalled years later, he was appalled by the officiousness as well as by the brutality. His father died when he was 12. And he had just finished secondary school and one semester at the Berlin Conservatory when, in 1943, he was drafted into the Wehrmacht and assigned to care for army horses on the Russian front. He kept a diary there, calling it his ‘attempt at preserving an inner life in chaotic surroundings’. Instead of returning to the disastrous campaign in Russia, he was diverted to Italy, along with thousands of other German soldiers. There, on 5 May, 1945, just three days before the Allies accepted the German surrender, he was captured and imprisoned. It turned out to be a musical opportunity: soon the Americans were sending him around to entertain other P.O.W.’s from the back of a truck. The problem was, they were so pleased with this arrangement that they kept him until June 1947. He was among the last Germans to be repatriated. Because of his youth, Mr. Fischer-Dieskau had been in no position to make his own choices in the 1930s and ’40s, so he didn’t encounter the questions about Nazi ties that hung over many a prominent German artist after the war. 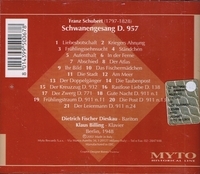 Mr. Fischer-Dieskau gave his first professional lieder recital in Leipzig in the fall of 1947. Success followed success, with lieder performances in Britain and other European countries, beginning in 1949. He first toured the United States in 1955, choosing for his New York début to sing Schubert’s demanding WINTERREISE cycle without intermission. He had made his opera début in 1948, singing Posa in Verdi’s DON CARLOS at Berlin’s Städtische Oper (later renamed the Deutsche Oper), where he was hired as principal lyric baritone. He also sang regularly at the Bavarian State Opera in Munich and appeared frequently in the opera houses of Vienna, Covent Garden, Salzburg and Bayreuth. Versatility was not the least of Mr. Fischer-Dieskau’s assets. He tackled everything from Papageno in THE MAGIC FLUTE to heavier parts like Wotan in DAS RHEINGOLD and Wolfram in TANNHÄUSER. He recorded more than three dozen operatic rôles, Italian as well as German, along with oratorios, Bach cantatas and works of many modern composers, including Benjamin Britten, whose WAR REQUIEM he sang at its premiere in 1962. Mr. Fischer-Dieskau’s insistence on getting things right comes through vividly in scenes of him at rehearsal or conducting master class. In a widely circulated video at the time, showing him coaching a young Christine Schäfer, Ms. Schäfer is singing beautifully, or so it would seem to your average mortal, yet the smiling maestro interrupts time and again to suggest something better. And it isn’t merely that he is invariably correct; it’s also that when he rises to sing just a few illustrative notes, the studio is instantly a stage, and he illuminates it with what seems to be an inner light.